Professor of Bioengineering John P. Fisher and graduate student Anthony Melchiorri have developed a better material for 3D printing of vascular implants. 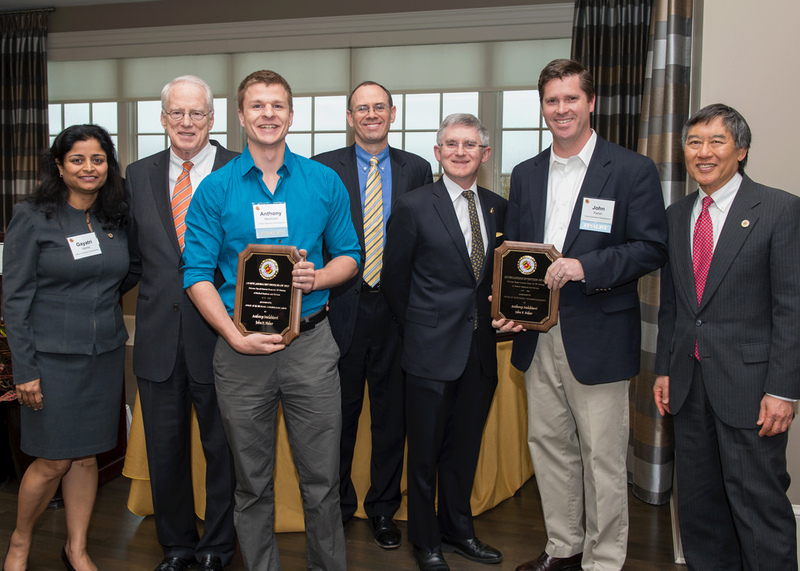 A better material for the 3D printing of vascular implants, a new technology that makes cloud storage more secure and efficient, and a low-cost, high-energy solid state lithium-ion battery are the University of Maryland 2013 Invention of the Year winners. The winning inventions were announced at the university's Celebration of Innovation and Partnerships event on April 29, 2014. Also announced was the recipient of the Corporate Connector of the Year Award, Michael Pecht, director and founder of the UMD Center for Advanced Life Cycle Engineering. This award recognizes a University of Maryland researcher, staff or unit that has achieved significant engagement with the private sector in corporate research, philanthropy, or student support. Meet the winning inventors: Professor of Bioengineering John P. Fisher and graduate student Anthony Melchiorri have developed a better material for 3D printing of vascular implants. Fisher and Melchiorri's polymer-based material resin meets one of the biggest challenges in medical uses of 3D printing: the need for biodegradable and biocompatible materials that support cell and tissue growth while degrading over time. Its mechanical properties, strength, and elasticity mimic those of actual blood vessels. Because it is also biodegradable, the patient's own tissue replaces it over time, reducing or eliminating the need for further surgeries. Fisher and Melchiorri agree that the biggest contribution of their work is the revolution it might bring to the treatment of cardiovascular disease in children. Read more here. UMD assistant professors Elaine Shi, computer science, and Charalampos Papamanthou, electrical & computer engineering, together with a UC Berkeley colleague, the late Emil Stefanov, a Ph.D. candidate in computer science, have developed a dynamic proof of reliability scheme that requires 300 times less bandwidth and that efficiently records updates on data without relinquishing the guarantee that a client's data is authentic. Data storage is one of the most popular applications of cloud computing. However, most current methods for ensuring remote data retrieval from cloud storage are designed for static data, and the few that respond to updates are both costly and require a high level of bandwidth. According to Shi and Papamanthou, their new approach accomplishes a great deal in building a more secure and usable infrastructure for cloud computing. UMD Engineering Professors Eric Wachsman and Liangbing Hu of the UMD Energy Research Center, and University of Calgary colleague Venkataraman Thangadurai, associate professor of chemistry have designed an intrinsically safe, low-cost, high-energy solid state li-ion battery that reduces manufacture costs dramatically. Typically, li-ion batteries contain a liquid material that can ignite under certain conditions. Even though solid state li-ion batteries are considered the next generation solution, their high manufacturing costs present a major challenge to widespread production. This new low-cost li-ion battery cannot catch fire and has a significantly greater energy density, meaning that electric cars can go farther on a single charge and thus reduce users' range anxiety. The designers say its potential for changing how consumer electronics, electric vehicles, and aerospace industries operate is significant. Meet the Corporate Connector of the Year: Professor Michael Pecht is the founder and director of the Center for Advanced Life Cycle Engineering at UMD which is funded by over 150 of the world's leading electronics companies at more than $6M per year. The CALCE Center received the NSF Innovation Award in 2009. He is also a Chair Professor in Mechanical Engineering and a professor in applied mathematics at the University of Maryland. He has written more than twenty books on product reliability, development, use and supply chain management and over 400 technical articles. He has also written a series of books of the electronics industry in China, Korea, Japan and India. He consults for 22 major international electronics companies, providing expertise in strategic planning, design, test, prognostics, IP and risk assessment of products and systems. More about Pecht can be found here. This event was part of the University of Maryland's 30 Days of EnTERPreneurship, a month-long celebration and exhibition of innovation and entrepreneurship on the College Park campus. Speakers at the reception included UMD President Wallace Loh; University System of Maryland Chancellor & Chief Executive Officer William E. (Brit) Kirwan; UMD Vice President and Chief Research Officer Patrick G. O'Shea; UMD Office of Technology Commercialization Executive Director Gayatri Varma; UMD Associate Vice President for Innovation and Entrepreneurship Dean Chang and UMD Associate Vice President for Corporate and Foundation Relations Brian Darmody. The Invention of the Year Awards reception is hosted by the Office of Technology Commercialization, a department under the Division of Research and part of UM Ventures. Finalists are selected based on their impact on science, society and market potential. Of the 154 inventions OTC received disclosures for in 2013, only eleven were chosen as finalists. A complete list of the finalists can be found here. The UMD Corporate Connect Council is a university-wide collaboration that supports information sharing, partnerships and campus efforts to engage the private sector in support of research, philanthropy and scholarships funded by the private sector.